The Construction Costs Index of the A.C. of the Basque Country fell 0.2% in November 2005 with regard to the previous month, by which the inter-annual rate for the month came to 4.0%, according to EUSTAT data. 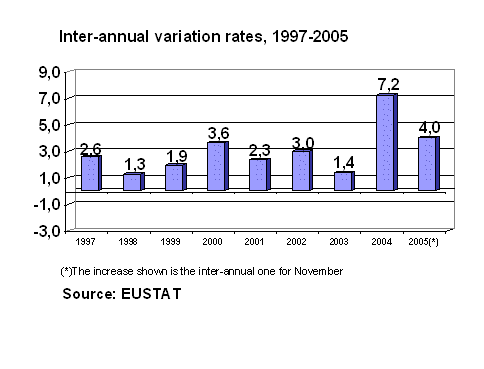 In November 2005 labour costs did not vary at all (0.0%), while raw material costs registered a 0.3% decrease. The subsectors Building and Civil Works registered different evolutions in raw material costs: the costs for Building fell by 0.2% with regard to the previous month, while Civil Works saw a 0.9% decrease. The result for the whole was -0.3% due to the higher weight of the Building subsector that Civil Works. In the inter-annual evolution of these subsectors there were similar variations: raw material costs for Building rose 3.8% and costs for Civil Works increased by 3.4%. In November, the highest growth in prices corresponded to raw materials consumed by Electric energy (3.7%), Explosives and gases (1.8%), Paints and varnishes (0.6%), Baked earth (0.5%), Structures and boilermaking (0.3%) and Glass (0.3%), among others. There was a reduction, however, in the raw material prices for Oil by-products (-6.8%), Metal piping (-4.8%), Asphalt products (-3.6%), Lime, gypsum and plaster (-2.4%), Oils and greases (-1.5%), Cleaning and higiene material (-1.2%) and Artificial Cement (-0.4%), among others. Among the prices of raw materials consumed by the sector that experienced higher rates of inflation over the whole of the last twelve months are: Asphalt products (35.5%), Oil by-products (21.0%), Explosives and gases (7.1%), Baked earth (6.7%), Manual tools (6.3%) and Worked stone (5.9%). On the other hand, there were inter-annual price reductions for the raw materials used by Metal piping (-4.3%), Cal, yeso and escayola Lime, gypsum and plaster (-2.3%), Cleaning and higiene material (-2.2%), Office material (-2.1%), Electric energy (-0.5%) and Metal structures and boilermaking (-0.3%).